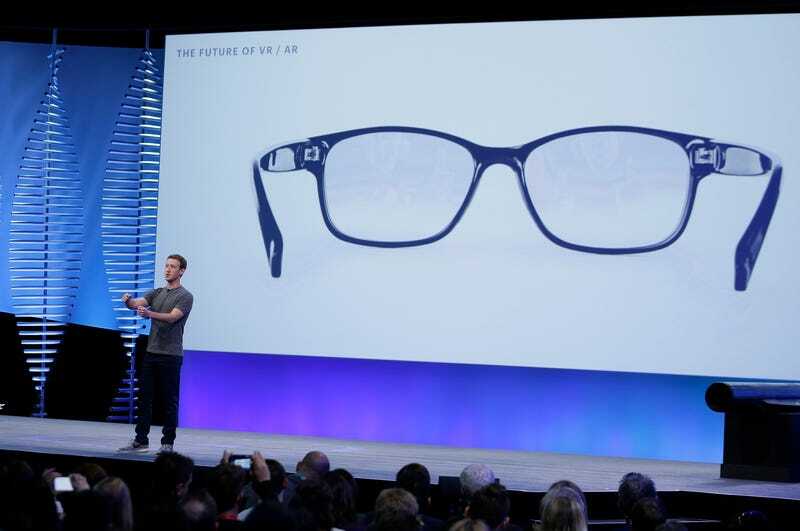 Facebook CEO Mark Zuckerberg talks about augmented reality glasses during the keynote address at the F8 Facebook Developer Conference Tuesday, April 12, 2016, in San Francisco. Facebook is reportedly dumping resources into developing nifty new augmented reality hardware—but don’t put money on seeing its products anytime super soon. Business Insider’s Rob Price has revealed in a report published Thursday that Facebook shifted hundreds of its employees from its research outfit Facebook Reality Labs over to a team—led by Michael Abrash and Andrew “Boz” Bosworth—that will specifically focus on work on AR hardware, including Facebook’s anticipated AR spectacles. The company declined a request for comment about specifically how many employees had been or continue to be shifted to this new team, but Facebook spokesperson Tera Randall told Business Insider that it was in the ballpark of “a few hundred people” and that the company planned to expand both teams this year. While Price’s source said the glasses could potentially see a launch around 2022 after push-backs, Randall told him that his “intel on release dates is wrong” and that the company was currently working on multiple AR products that may not even ever see official launches.